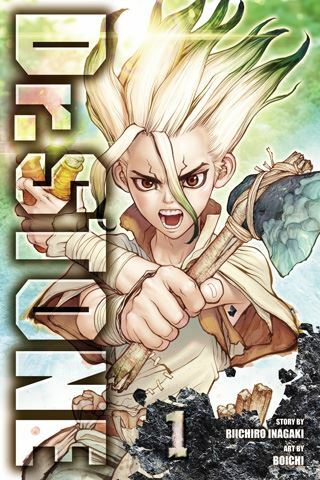 Get Drawn Into Moonstone's "Savage Beauty"
Dr. Stone is a shonen manga from writer Riichiro Inagaki and artist Boichi. Inagaki is a manga writer known for his work on the series, Eyeshield 21. “Boichi” is the pen name of manhwa artist, Mujik Park, a Korean-born artist living and working in Japan. Set thousands of years in the future, Dr. Stone focuses on the efforts of two friends to revive human civilization. Dr. Stone, Vol. 1 (Stone World; Chapters 1 to 7) introduces Taiju Oki and Senku. Taiju is petrified of admitting to fellow high school student, Yuzuriha, that he loves her. His friend, Senku, is a high school science prodigy who watches Taiju's pitiful efforts with disdain. Suddenly, one fateful day, a blinding flash petrifies everyone, turning every human into a statue, and civilization gradually falls apart. Then, one day Taiju reawakens, bursting from his stone shell, but he is shocked to discover that it is 3700 years later! And he is not alone, as Senku has been up and running for over half a year. Now, the two must kick-start civilization, which will not be easy, even with the power of science. Dr. Stone Graphic Novel Volume 1 reveals this manga as a something quite unique. Writer Riichiro Inagaki offers a compelling story, a far-flung future that is the setting for the rebirth of humanity. He presents engaging characters – two teen friends who form one of the most delightful opposites-attract duos that you will find in comics. I READS YOU RECOMMENDS: Readers looking for odd shonen will want to try the Shonen Jump title, Dr. Stone.